GPR-SLICE Vector Imaging accounts for the full 3D yaw - pitch - roll of the GPR antenna on any surface. GPR-SLICE can import yaw - pitch - roll data streams recorded from onboard accelerometers attached to GPR equipment or it can also generate vector navigation based on assumed antenna surface normals with topography or designed infrastructure surfaces. GPR-SLICE Software stores the normalized vector in columns 9,10, 11 of our generalized GPS navigation files associated with each radargrams and can project radargram into any 3D space recorded. 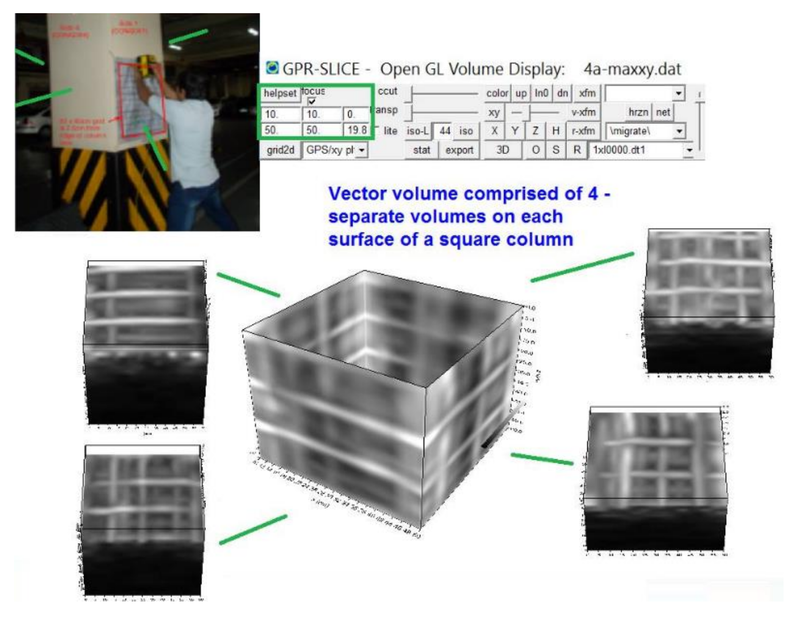 GPR-SLICE can generate psuedo solid 3D vector volumes from coarsely spaced data by several methods, including adjacent radargram interpolation with interpolation of the vector navigation files. 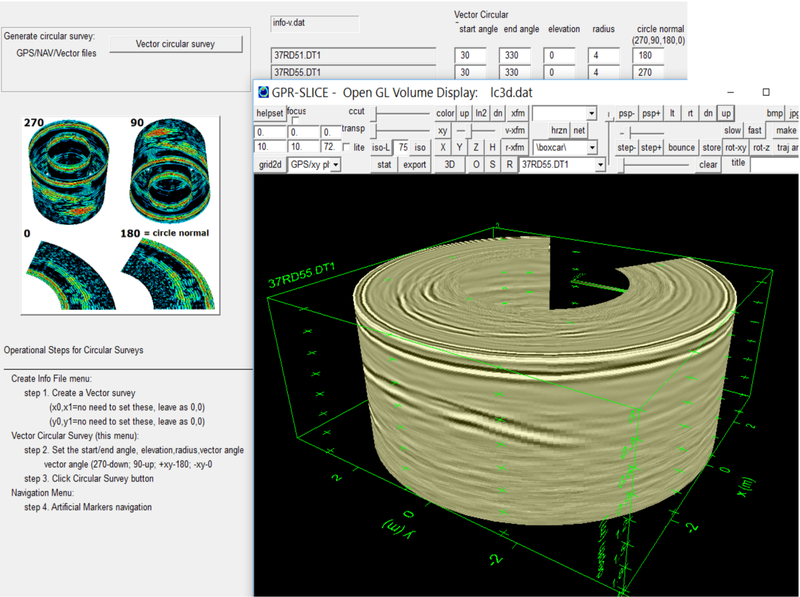 GPR-SLICE has several menus to assist the user to generate vector files for simple structures like tunnels, cylinders, cones, on horizontal wall and on variable track surveys. 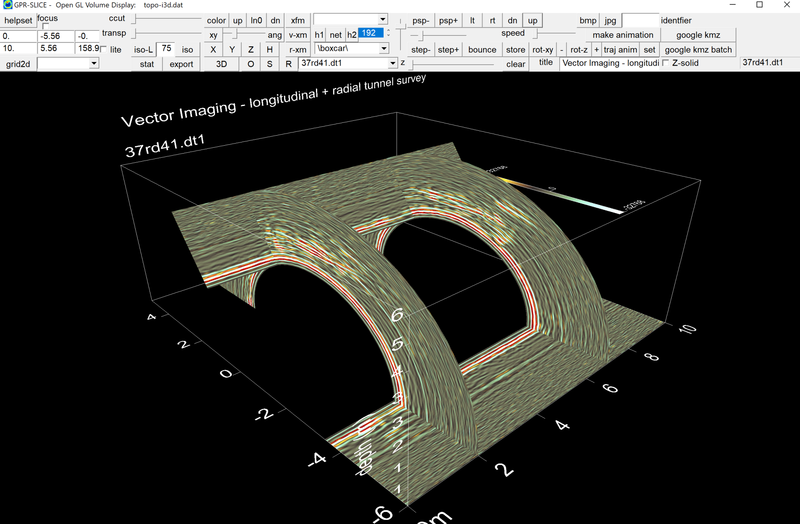 Vector imaging with profiles made on radial and longitudinal directions on a tunnel. Vector imaging with profiles made on 3 walls from inside of a room. Vector imaging with hi-density volumes made and added together from 4 sides of a square column. GPR-SLICE has menu items to adjust circular vectors to make cone vectors. The example was actually designed for GPR surveys on a concrete cooling tower that was coned shaped. Vector imaging on the walls with variable depths such as in subterranean mines can be developed. The following is idealized example from data collected by Virginia Tech. GPR-SLICE can generate assumed vector navigation on topography from imported digital elevations models where the GPR antenna is taken to be flush over the topography surface during data profiling. 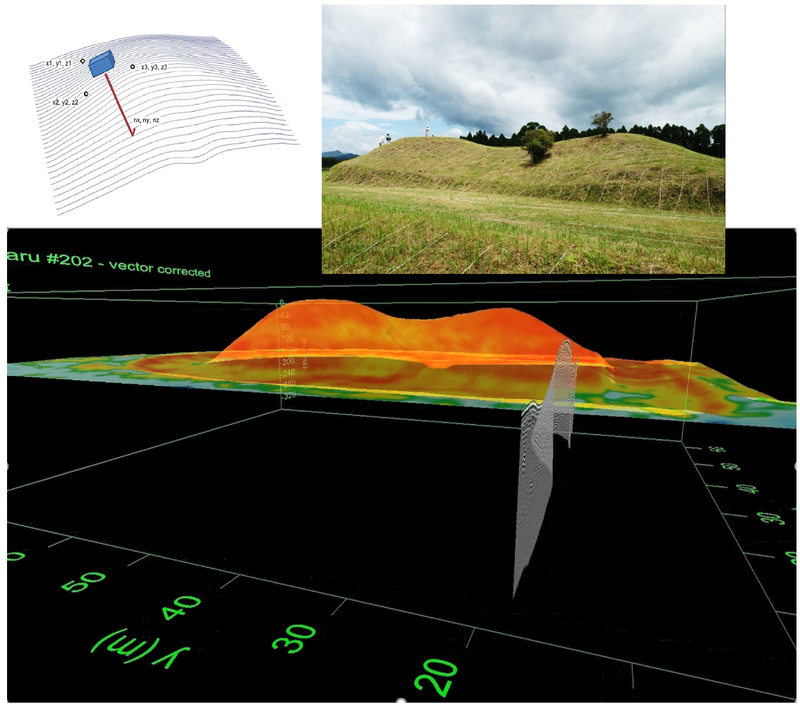 With vector imaging, GPR-SLICE projects 2D radargrams into their real 3D space. GPR-SLICE has a menus to assist the user to generate circular vector such as for surveys made on round tanks. Tunnel Longitudinal Survey example dataset. Just unzip the project folder and go to OpenGL Volume to see the tunnel longitudinal radargram display. Follow the above video to reproduce this vector navigation for tunnel longitudinal surveys. 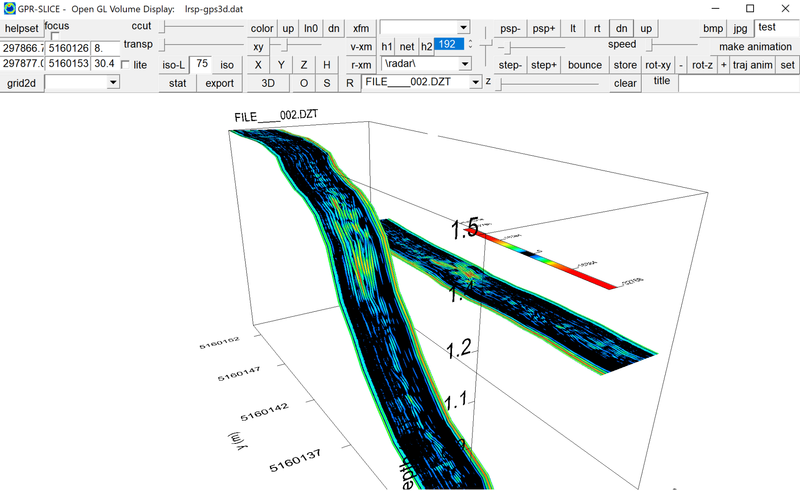 Tunnel Radial Survey example dataset. Just unzip the project folder and go to OpenGL Volume to see the tunnel radial radargram display. Follow the above video to reproduce this vector navigation for tunnel radial surveys.